La nueva y tan esperada cabeza Bento de LOGO ya esta aquí, se ha hecho esperar pero ha merecido la pena. Pese a que cada vez hay mas cabezas mesh donde elegir, es sin duda esta una de las mejores opciones. Como siempre, totalmente customizable y con las mejores opciones en cuanto animaciones para mi gusto. Ademas, las opciones aun inactivas en la sección de gestos me hacen estar doblemente ilusionada porque significa que irán añadiendo mas y mas! Es genial! Este es un primer post, pero habrá mas, donde iré explicando todas las funciones, aquí os dejo un vídeo mostrando los menús y gestos y algunos de los textos originales de LOGO que iré traduciendo. Your LOGO mesh head comes with everything you need to have a complete, matching avatar right out of the box, including SL body shapes, various skin tones, eyes, lashes and many other customization options. This bento compatible head provides a realistic looking face, high quality facial animations, and high resolution skin and makeup textures. The included SL body means it will work with most SL clothing however it is also fully compatible with mesh bodies and supports Omega skin and makeup appliers. Your possibilities are endless! This LOGO head is interactive, meaning you can customize your makeup or change your facial expression with a couple of clicks. Each expression has 3 options you can select. Clicking the picture will select the full expression, which will play immediately. The Upper and Lower buttons on the left of each picture allow you pick either the top or bottom of the expression so that you can combine 2 different expressions together to form a new expression. You then use the Start Animation button to play the combined animations in sync with each other (see below). The expressions with a snowflake in the corner can be "frozen" so that the expression stays static. This is useful either for taking pictures or for keeping a static look for your head, for example keeping her smiling or pouting her lips. (See more about how to freeze in the Buttons section). Any expression animation can also be combined with a head motion by selecting one of the options on the right. This gives each expression even more options. For example you can combine a smile with a head nod when you want to agree with someone. Head motions are green when they are active and while active will play with any expression you select. We'll talk about the Freeze animation button first. Any expression with a snowflake in the corner can be frozen into a static expression. Click the Freeze Animation button to activate it. While it's active, when you play an expression it will remain frozen until you either click the expression again if you've selected a full expression (the picture of the face) or until you press the Stop Animation button (see below). The top 2 buttons in this section are Start Animation and Stop Animation. The main purpose of these buttons is to play your chosen combined expressions and possibly a head motion. Your selections will be highlighted green and play together when you click Start Animation. If the expression has been frozen you can use the Stop Animation button to end the expression and go back to default. The Set Default button will take the last expression you played and set it as your default head state. 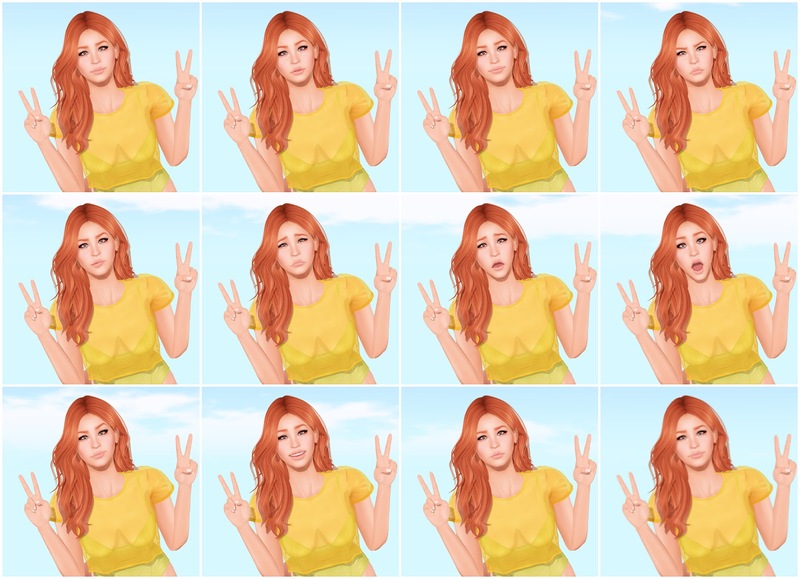 That means, for example, if you set a smile as the default she will keep the smile and if you play another expression it will go back to the smile once the new expression has finished or is stopped. Please note that if you have a head motion active when you click Set Default it will be stored with the default and play each time the head goes back to default which might not be a result you want. It's best to set your default without a head movement active. The Blink On/Off button turns off the automatic blinking. While it's green it's active and the head will blink randomly, if it's off she will never blink. Blinking is turned on by default. Eye Movement On/Off is used to control the scripted eye movements. The head comes with an eye animation that will have her look around naturally, including having the eyelids follow along. If you want to go back to the default way Second Life handles your eyes moving you can turn off this button. It is On by default. You can choose a direction for your characters eyes to be looking by using one of the 17 direction buttons in this section. While your eyes are locked into position blinking and other eye movements are temporarily paused. You can greatly expand your heads capabilities by combining the expressions with chat commands. This will allow you to do things like having the character smile if you type :) in chat or shake her head and frown if you type No. You can also assign any full animation, top, bottom or head motion as a random expression which will play on their own at random times. You can assign the last animation you played to either a chat trigger or add it to a list of random emotes by using the commands below in local chat. -random - removes the last animation you played from the list of random emotes, assuming the last animation played was saved in the list. If you're trying to remove a previously saved expression from the random emotes list you must play it first. Use listemotes to show which combination you may have used. clearrandomemotes - deletes all saved random emotes.